At least 43 people have been killed after a bus plunged 200m (660ft) into a ravine in western Guatemala, rescue workers said. The crash happened in San Martin Jilotepeque, some 65km (40 miles) from the capital, Guatemala City. At least 40 people are thought to have been injured in the accident. 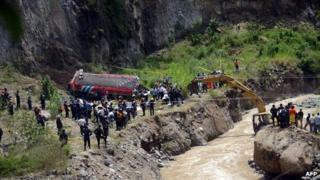 The bus had been travelling from Chimaltenango to San Martin Jilotepeque. The cause of the crash remains unknown. Mario Cruz, spokesman for the local volunteer fire department, said about 90 people had been on board the bus which had an official capacity of 54 passengers. The dead included at least three babies, he added. The mayor of San Martin Jilotepeque, Otto Vielman, said it appeared that the bus had crashed against a wall of rocks and then fallen from a cliff. The rescue operation was hampered by a fast-flowing river and emergency crews installed cables to carry stretchers over the water. The long arm of a mechanical digger was also used to lift people across the river. Local residents volunteered to help the rescue operation and pictures from the scene showed some onlookers in tears as bodies were lined up alongside the crushed wreckage of the bus. Local resident Carlos Jose Perez said many of those on the bus had been taking farm produce to market. "The people here are really in mourning," he said. Several of the injured were transferred to local hospitals and some to Guatemala City.